Did she resign or was she pushed? calls for investigation into #financial #irregularities! President Donald Trump appeared in the Oval Office alongside Mrs Haley to say she had done “an incredible job” as the US Ambassador to the UN Nikki Haley announced she is resigning – after nearly two years in the post. The 46-year-old former South Carolina governor – one of the few women in the Trump cabinet, and definitely the most high profile, gave no reason for her exit but dismissed speculation she was planning to run for president in 2020. As she sat smiling beside the President, their unusual photo opportunity and the generosity of a President whose good mood may owe much to his current political roll, suggested Haley has the essential ingredient of high-flying political careers timing. She could cash in on her chance to make some serious money, having made many connections during her role as the US ambassador to the UN. 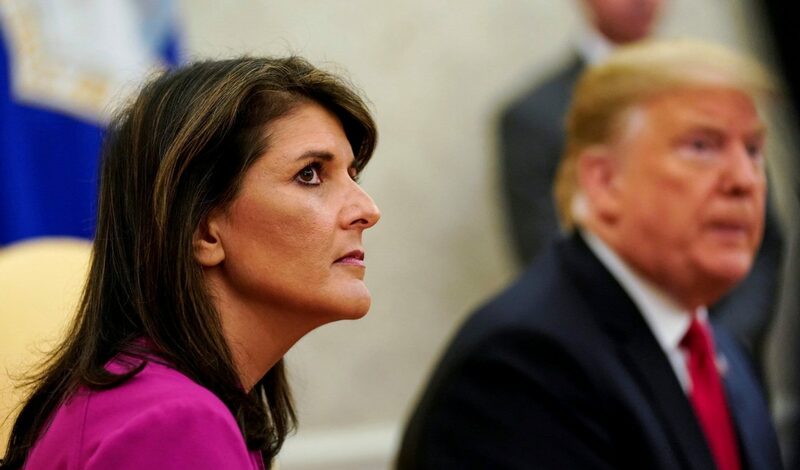 Her stated reason is that she just wants a rest from public service after years as South Carolina’s governor and more recently her ambassadorial role to the UN. Or is she avoiding an upcoming PR disaster to preserve her image for a future campaign. Because her resignation comes a day after an anti-corruption watchdog accused her of accepting seven luxury private plane trips as gifts from South Carolina business leaders. During her term, she was aggressive often to the dismay of her allies. Statements like she was going compile a list of anti-Americans countries who didn’t support the agenda; bullying and intimidating anyone who stood in her way. She was a ferocious UN ambassador; Trump’s wrecking ball towards anything anti-Jewish and anti-American. Fiercely critical of what she claimed was the global body’s anti-Israel’s bias, she supported shutting off US funding for the UN’s Palestinian refugee agency and revelled in defending the Trump administration’s decision to move its embassy in Israel from Tel Aviv to Jerusalem. A critic of Russia and Syria at the UN, she was instrumental in pressuring China to support a tough sanctions regime against North Korea. She is the 23rd member of the Trump administration to resign her post. And although this looks civil in the light of day, with her posing with the president and Ivanka, it would not be unusual for a politically ambitious and savvy character to distance herself from Trump. It may be, over the next year, she will move back to her original position, where she was a staunch critic of Trump, even suggesting he would lead the country to a war. That would lead her nicely onto a platform where she could launch her own leadership agenda.